From left to right: Debra Jacobson, associate director, Illinois Sustainable Technology Center; Todd Rusk, Smart Energy Design Assistance Center director of operations; Brian Deal, SEDAC executive director; Richard J. Winkel, Jr., deputy executive director, Prairie Research Institute at Illinois. 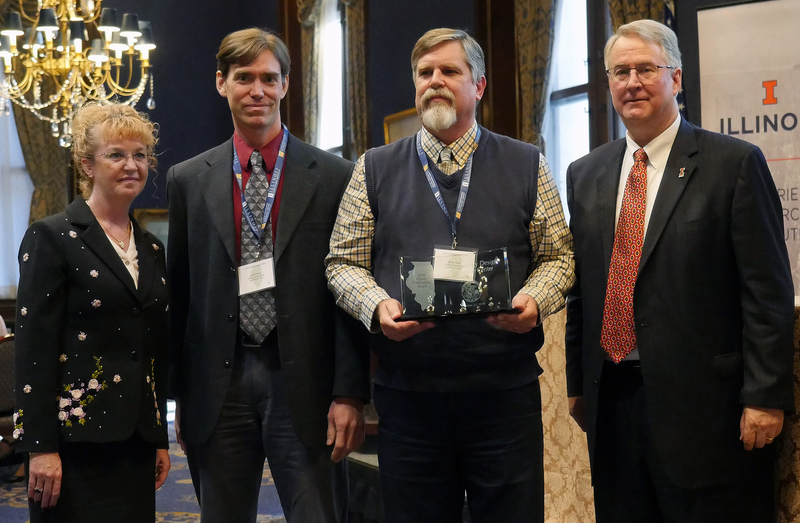 “Illinois’ success as an economic and cultural leader depends upon our responsible management of natural resources, as well as sustainable development,” said Kevin OBrien, the director of the Illinois Sustainable Technology Center, which administers the awards program. The center is part of the Prairie Research Institute at Illinois. The Smart Energy Design Assistance Center at Illinois was among the 27 winners of the Illinois Sustainability Award. Since 2004, SEDAC has been reducing the energy footprint of the state of Illinois through design assistance, outreach, research and education. Housed in the College of Fine and Applied Arts, SEDAC is a public-private partnership with 360 Energy Group. The center’s vision is a world in which all people have access to affordable, reliable and clean energy. It has provided technical assistance with energy savings recommendations to more than 2,700 public and private facilities and communities in 94 Illinois counties, and has offered advice to over 5,500 callers. Implemented energy-efficiency measures from SEDAC recommendations have led to cumulative savings of 2.4 billion kilowatt hours and 117 million therms, saving nearly $300 million for Illinois businesses, public sector facilities and communities, and helping to create or sustain 2,700 jobs. Since 1987, ISTC has presented Sustainability Awards to organizations in Illinois that have demonstrated a commitment to environmental excellence through outstanding and innovative sustainability practices. Any Illinois public or private organization is eligible to apply for the award. Winners are selected through a rigorous process of review and examination by ISTC technical assistance experts. More information on the Illinois Sustainability Awards program, lists of previous winners and information on technical assistance services are available from the Illinois Sustainable Technology Center, One Hazelwood Drive, Champaign, IL 61820, 217-333-8940.